We are pleased to say that the first phase of the renovation and development of Camprond Farmhouse is completed, providing five large bedrooms with en-suite facilities, a large sitting room, dining room and kitchen with utility. Additionally, the second floor has its own sitting area and kitchenette. The ground floor has wheelchair access throughout and has an adjoining stone barn, which will be converted to provide an open-plan fully high level disabled friendly living area with kitchen, sitting area and bathing facilities. The disabled friendly kitchen area will have an induction hob, appropriate oven, microwave, washing machine, tumble dryer and will also allow for a fully self-contained living area with separate entrance, but there is also access into the sitting room of the main house if required. Support teams will be accommodated on a mezzanine floor above the disabled-friendly accommodation. The second phase is now underway. We have also had the opportunity for the farmhouse and outbuildings to be surveyed by Jane Ferguson and Maria Morris. They were very excited to find that there were no negative energy lines – only positive and healing energy going through the building, with a vortex of energy in the dining room, sitting room and kitchen areas, pretty much throughout every room of the house. All of this positivity can only enhance what we are going to be providing to our clients, our own Case Managers and others. As well as an opportunity for our walking wounded clients to enjoy the farm and what the surrounding area offers, we will also be running various residential courses and workshops such as mind, body and soul courses and culinary courses. We are planning to make use of organic herbs and vegetables from the large kitchen garden area, once it has been completed. These will be grown in raised beds and there will be opportunities for volunteers to spend time in France in lieu of assistance with developing this. So all those with green fingers – let's hear from you! There is also a hen house in the kitchen garden that we plan to renovate and stock with hens and a cockerel at some point in order to add fresh eggs to our menus. This next year will enable us to identify the inevitable snagging list and to complete phase 2 – i.e. the disabled friendly studio apartment in readiness for the following year. There is a paddock area surrounding the house and barns and a number of thoughts are being considered for this use. Our house in France is in Camprond in the Manche (Normandy) region in the North of France and is equidistant between the two historic towns of Coutance and St Lo. The property is situated at 15 Le Bourg, Camprond, and is within 20 minutes of local beaches and close to many points of interest. 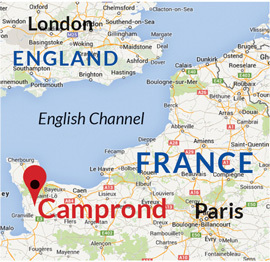 Camprond is just one hour's drive from ferries and airport. 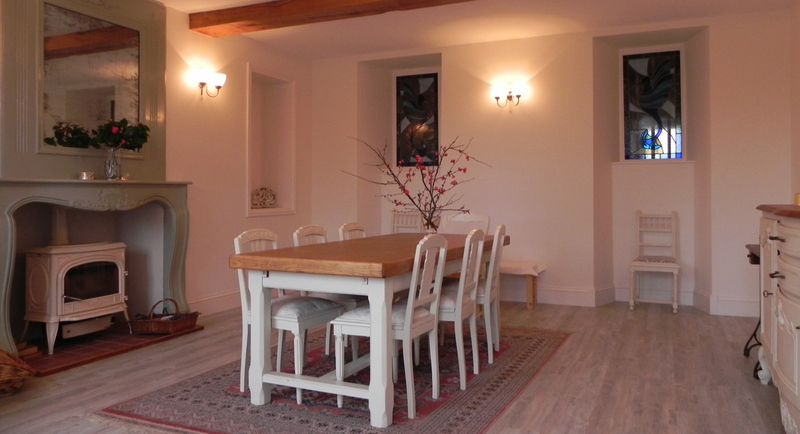 Five-bedroomed farmhouse with large sitting and dining rooms – a conservatory. Stone barns are being developed for recreational activities. High-specification kitchen suitable for cookery lessons. Adapted living areas for partly and fully disabled clients and their support teams. Spaces for art and woodworking studios. Vegetable garden area and field. 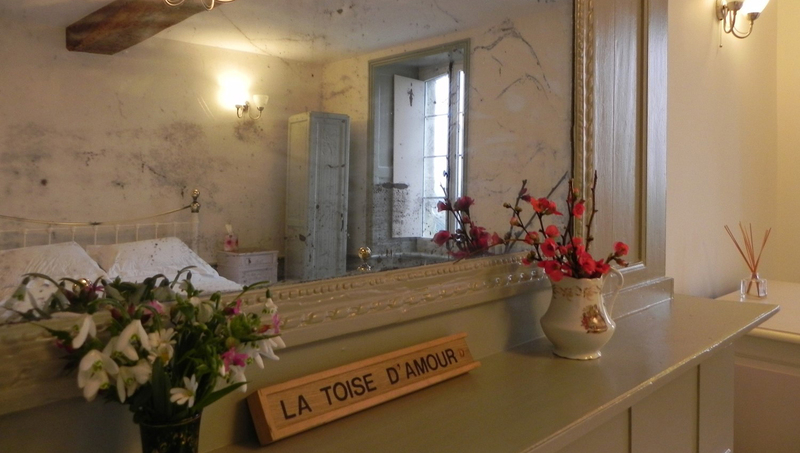 "Thank you for sharing your beautiful French Farmhouse. We had an absolutely fabulous time and we could not have asked for a more beautiful and peaceful place to stay. The garden surrounding the house completed the whole sense of calm with roses, hydrangeas, hedging, and sheltered areas to sit and take in the views across idyllic French countryside. We found so many things to do within an easy drive including visiting the leading tourist destinations of Mont-Saint-Michael, The D-Day landing beaches, and The Christian Dior museum. Having fabulous beaches within approximately a 35-minute drive was great, and I would highly recommend the wild beach called Plage de la Vieille Eglise and its miles of sand dunes. With plenty of historic towns and markets to visit we quickly all became immersed in the friendly French culture. The drive from the ferry was surprisingly straightforward along excellent roads. We did not want to leave, and hope to return. Thank You! Angela, Paul, and Florence. August 2017"